On September 28, 2017 Willy Bett the Cabinet Secretary for Agriculture launched the Hass Avocado Fruit Project at Sosiot in Kericho County. The CS underlined the need for farmers to diversify their farming activities beyond tea and coffee, into other crops such as Hass Avocado and Sweet Potatoes. Kericho County is endowed with excellent climatic conditions that favor the production of a large variety of crops. Farmers therefore need to fully exploit this potential by venturing into other varieties of crops. Earlier in July 14, 2016, Mr. Bett led a Japan delegation who toured of the Mwea Scheme to launch Sh20 billion Thiba Dam construction at Rukenya village to boost rice farming in the Mwea Irrigation Scheme. In his capacity, he praised the Japan government for partnering with Kenya to boost rice farming, a staple of many Kenyans. During that forum, Mr. Willy Bett called Kenyan residents to venture into avocado farming, saying that the market in France and other European countries was huge. The CS said the national government would promote farming of avocados by licensing the establishment of seedling nurseries. He explained that there was high demand for avocado produce in France and other European countries and emphasized of the need by the farmers to venture into farming. According to Bett, the market of avocado is so huge and the government is determined to ensure the farming thrives. The Cooperative movement is a beacon of hope in financially empowering small-scale farmers. The Cooperative movement also accounts for about 45% of our GDP thus qualifying to be the most effective model of securing socio-economic growth at the grassroots. 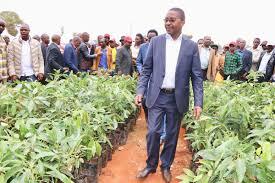 Mwangi joined thousands of Avocados farmers drawn from all the Sub-Counties in Muranga for the launch of the Murang’a Avocado Farmers Union. 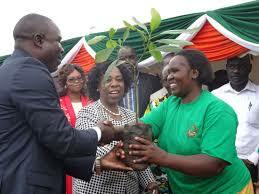 This union is an umbrella cooperative entity consisting of eight Sub-County based Avocado Farmers Saccos. The Cooperative is one of the interventions initiated by the Muranga County Government in promoting and enhancing commercial hass Avocados farming in the County. The Sacco is an essential marketing tool as it guarantees deeper market penetration and proper bargain measures. The Sacco also salvages the small farmer from exploitation by middlemen. Farmers training and provision of farm inputs such as avocado tree seedlings will also be effectively rolled out with the structures established by this Sacco. This is in addition to securing a friendly savings and credit facility for the farmers in this Cooperative. Since the year 2013 the Muranga County Government has given farmers thousands of hass Avocados tree seedlings and established marketing partnership with buyers increasing the price per fruit to above 8 shillings up from as little as 1 shilling in the year 2012. The above approaches and others are geared toward boosting hass Avocados farming in Murang’a and increasing the proceeds from this hass avocado farming. For seedlings and any other information Kindly contact us or visit our office. who can i contact as agronomist i also need 3000 hass avocado seedlings. Hello Patrick, we could like to know where you are based we can come to your farm for agronomical purpose also for seedlings please contact 0723662773 for advice.